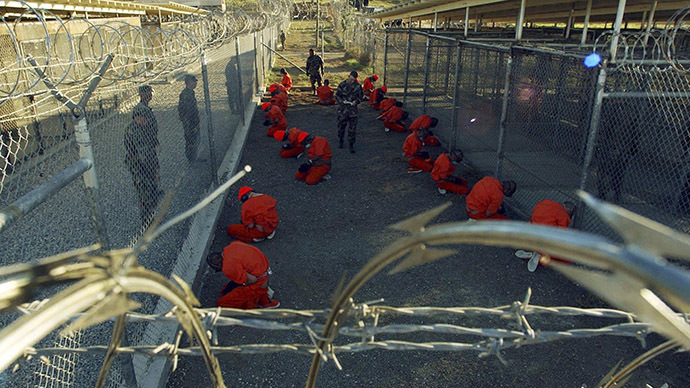 A new PBS documentary examines the alleged propaganda fed to the American public by the CIA, detailing the interrogation methods widely described as torture. It looks at two very different tales of the CIA's tactics, and speaks to its former top dogs. They say there are two sides to every story, and tales from Washington are no exception. The PBS Frontline documentary'Secrets, Politics and Torture'has delved into the controversy surrounding the CIA's “enhanced interrogation techniques,” and interviewed two of those at the forefront of the war on terror. The two sides are the CIA – which claims its interrogation techniques saved lives and led to the killing of Osama bin Laden – and the Senate Intelligence Committee, which examined 6 million pages of CIA documents over a six-year period. Perhaps the best introduction into the opposing sides is to mention the 2012 blockbuster film “Zero Dark Thirty,” which takes viewers on a journey of hunting down Bin Laden, and eventually killing him. Details for the film were provided by the CIA itself. The information relayed from the agency was played out for the big screen – but it didn't come without controversy. “The movie left the American people with the impression that torture worked, and that without it we would never have been able to trace the trail back to Abbottabad and to find Bin Laden,” said Richard Clarke, who served in various roles in the National Security Council from 1992 to 2003. But there was a group in Washington who had a very serious issue with the film – and they came in the form of the Senate Intelligence Committee. A team from the committee had spent six years trawling through 6 million internal CIA documents, seeing firsthand what the agency had been up to. And they say the reality is very different to what the agency told the Hollywood filmmakers. “I walked out of Zero Dark Thirty, candidly. We were having a showing and I got into it about 15-20 minutes and left. I couldn't handle it. Because it's so false,” said Sen. Dianne Feinstein (D-CA), former chairman of the Senate Intelligence Committee. The committee would eventually publish an extensive report on its findings in 2014. In less than a week, Rizzo managed to transform his thoughts into one of the most sweeping covert authorizations in US history, signed by President George W. Bush. It granted the CIA “unprecedented counter-terrorism authorities,” the Senate Intelligence report reads. Those authorities would be used to launch controversial interrogation techniques, described by many as torture. Their effect would be debatable, and their morality highly questionable. The agency decided it needed “enhanced interrogation techniques,” which would ultimately force detainees to divulge information on future planned attacks against the US. These included methods such as the attention grasp, calling, facial hold, facial slap, sleep deprivation and waterboarding, among others. But Rizzo saw a red flag. However, it was his job to get the tactics approved – and he did just that. While the CIA was confident that its “enhanced interrogation techniques” would lead to pertinent information, the methods turned out to be highly controversial, with many – including the Senate Intelligence Committee – claiming the techniques never led to answers, and sometimes led to lies. Despite the agency's efforts, it failed to get any information out of some detainees, often because they did not have any information to give, or had already given it before the enhanced interrogation techniques took place. Others, including alleged 9/11 mastermind Khalid Shaikh Mohammed, lied to the CIA agents when faced with the extreme interrogation methods. “We looked at 20 examples of where the administration was saying these techniques were effective, and we found that wasn't true at all,” Feinstein said of the Senate Intelligence Committee's investigation. But the report will likely stay under lock and key for some time. The Republicans are now in control of Congress, and Feinstein has been replaced by Richard Burr, who has recalled all copies of the 6,000-page report.